To provide this level of service while remaining profitable, it is vital for Segmüller to work productively and efficiently – and this is doubly true for warehouse processes. The process involved in labeling incoming goods offers significant scope for efficiency gains. For example, it is very time consuming to label all products using a central stationary printer, as employees have to walk regularly between the printer and the storage bays in order to collect the printed labels. In addition, the long walk from the printer creates an unnecessary source of potential mistakes, e.g. pre-printed labels can become mixed up – resulting in frustrating labeling errors. It was determined that a mobile printing solution could optimize the labeling process, maximize employee productivity, cut error rates and ultimately contribute to reduced costs. These are all good reasons why Segmüller deploys portable label printers for identifying products in its warehouse and incoming goods departments and increasing the productivity of its staff. The company has been using mobile printers successfully for many years, so when the time came to replace the existing system, a team led by Segmüller’s IT manager Gerhard Waschke decided to purchase a new generation of mobile printers. The company commissioned beic Ident GmbH, a long-standing partner and supplier of tailor-made hardware and software solutions in the area of identification systems. Its task was to implement a modern, efficient and rugged printer system that would increase productivity and efficiency in its warehouse operations to an even higher level. The RL4 portable label printer from Datamax-O’Neil was the successful candidate and 20 of the devices were put into operation in 4 warehouse locations in combination with MC9190 mobile computers from Motorola Solutions. The RL4 is precisely the printer solution that Segmüller required. 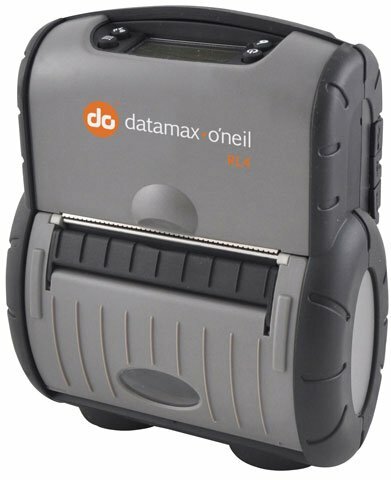 The 4-inch thermal printer from Datamax-O’Neil is one of the most rugged portable label printers on the market and was specially developed for use in challenging environments. It offers users maximum reliability and strength, continuing to print labels faultlessly even after serious incidents such as falling onto concrete. The downtimes and delays experienced with the previous solution have now been reduced significantly. Moreover, the RL4 is a high performance printer with a maximum printing speed of 102 mm per second. Another key criterion specified by Segmüller was that the solution should be simple to integrate into the existing IT environment. The printer from Datamax-O’Neil met this requirement. It offers emulations for a variety of printer languages and is compatible with Segmüller’s warehouse management software (WMS). Furthermore, Datamax-O’Neil designed the RL4 so that it can be worn easily on a belt or mounted on vehicles such as forklifts or order picking trolleys. The RL4 is also very practical and easy to operate thanks to its ergonomic design. In fact, the labelling material can be changed with just one hand. The introduction of the RL4 mobile label printer from Datamax-O’Neil has allowed Segmüller to achieve even greater efficiency gains in its warehouse processes. Employees transporting goods to storage bays and shelves scan the EAN code on the packaging using the MC9190 from Motorola Solutions. This data is then transmitted to the portable label printer, which produces a label using the scanned information. The labels are self-adhesive so they can be attached to the goods immediately. This has a number of advantages. Firstly, it virtually eliminates the risk of labeling errors. Secondly, it means that colleagues collecting the goods from the warehouse later for sale or dispatch will be able to find the items they need quickly. The RL4’s high printing speed also allows employees to produce more labels per hour. As the printouts are highly accurate and very few need to be rejected, Segmüller has also been able to further increase its productivity, improve its material consumption and therefore reduce costs. With a long rechargeable battery life and high material capacity, the RL4 generally does not require recharging or refilling with labelling material during a shift. Segmüller profits from both the low acquisition cost of the RL4 and its significantly lower operating costs compared to the previous solution. The primary reason for this is the printer’s rugged design.